If your name is Andrea, skip this post. 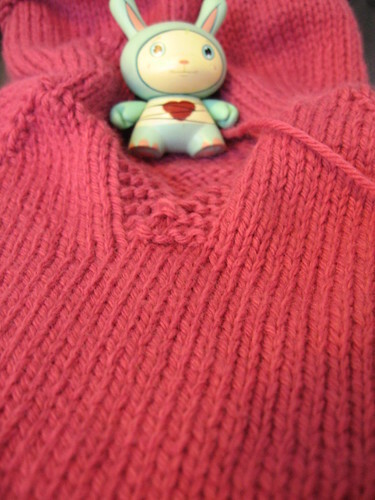 The dunny realizes it is too small for the sweater, but wanted to model it anyhow. I am much too large for the sweater so I was happy to oblige. I am strangely unaffected by the rose color. Normally, I don’t like it (I had my first set of passport photos taken in a sweater much this color, at the age of 13, when I didn’t know any better), but I don’t mind it here. It’s kind of cute. Woohoo! I’m on a roll! Knitting progress and working camera and all pertinent peripheral parts at once! I think I might treat myself to a soda. This entry was posted in General stuff, knitting and tagged baby knits, baby sweater, knitting, knitting progress. Bookmark the permalink. 1 Response to If your name is Andrea, skip this post.